Mama has new jewelry in the For Love of a Dog shop. 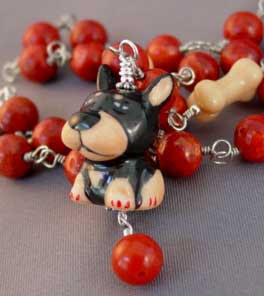 Not only some fun lampwork dog bone (or biscuit) earrings, some breed bracelets, but also some very cute Doberman Pinscher earrings and a necklace. This adorable dog charm could represent a Miniature Pinscher or mixed breed mutt, too. What fun! She's been busy on the computer the last couple of days, so I've been getting plenty of power napping done. I've needed a little rest since last week was perfect dog weather with temps in the low 70's and almost no humidity. I spent as much time outside as I could. When I wasn't working (security patrol, you know), I just relaxed on the deck and watched the hummingbirds fight. It was almost like a vacation!